Chateau La Nerthe is in contention for being one of the oldest estates in Chateauneuf du Pape. Historical documents from 1560 mention the estate. The historic chateau was built in 1736. Chateau La Nerthe deserves credit for being one of the first estates to bottle their own wine. This took place to some extent starting in 1784. Chateau La Nerthe is one of the first, if not the first estate in Chateauneuf du Pape to export their wine outside of France. Another first that belongs to the estate is that Chateau La Nerthe began the practice of destemming 100% of their vines in the 1800’s. By this point in time, Chateau La Nerthe was the most expensive wine to buy from the Southern Rhone. 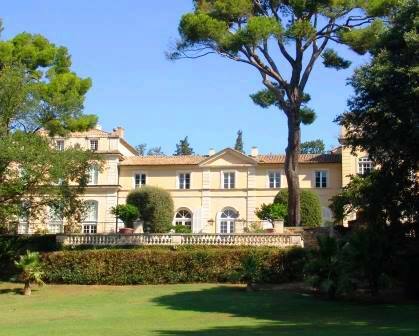 In 1870, the Tulle de Villefranche family sold the property to the Joseph Ducos family. The sale took place in part, because o the devastation caused to the vineyards by Phylloxera. The Ducos family maintained ownership of the property until 1941 when Chateau La Nerthe was bought at an auction by the Leclerc and the Motte families. Following World War 2, the spelling for the estate was changed. Instead of Chateau La Nerthe, the estate was renamed, Chateau La Nerte. Please note, the “h” was dropped. By 1985, Chateau La Nerthe had become dilapidated and was put up for sale by the Dereumaux family. The following year, in 1986, the property changed hands. The new owners of La Nerthe are the Richard family in a partnership with David and Foillard negociants. A complete renovation of the estate and took place and much of the vineyards were replanted. The new owners changed the spelling back to what it was by adding back the “h.” The new labels once again displayed the original spelling of Chateau La Nerthe. In 1991, Chateau La Nerthe was able to expand their holdings with the purchase of 22 hectares of vines, which helped to create one of the largest estates in the Southern Rhone with 90 hectares under vine. Starting with the 2015 vintage, Ralph Garcin was placed in charge of the estate and its winemaking. Previously Ralph Garcin was working for Jaboulet in Hermitage. The 90 hectare vineyard of Chateau La Nerthe has a terroir of rock, sand, clay and loam soils. Much of the vineyards and the chateau are located southeast of the village. You can look at their vineyards as being placed in two large blocks. 60 hectares of vines are adjacent and mostly in front of the chateau. There, you find more sand and clay in the terroir. The remaining 30 hectares are behind the chateau and abut the plateau of La Crau, which has more rocks and stones, known as galets in the region. Similar to what is planted at Chateau Beaucastel, the vineyards of Chateau La Nerthe are planted with all 13 types of grapes allowed in the Chateauneuf du Pape appellation. At Chateau La Nerthe, all the work in the vineyards is done using organic farming techniques. La Nerthe is one of the first estates to begin picking in the Chateauneuf du Pape appellation. To produce the wine at Chateau La Nerthe, the majority of the grapes are destemmed. Vinification takes place large, squat, conical shaped, French oak barrels. The grapes are all co-fermented. They are trying to mix things up here, so in time, you should expect to see several, new small vats added to their cellars, to help with more precise vinification. Some of those smaller vats will be used for specific parcels, which might only hold one specific variety. Techniques for aging varies, depending on the blend. The Mourvedre is aged in a combination of new and old, French oak barrels. The blend is Grenache and Syrah are aged in foudres and the Grenache and Cinsault are aged in traditional, concrete vats. The best vintages of Chateau La Nerthe are: 2018, 2017, 2016, 2015, 2012, 2010, 2009, 2007, 2005, 2001, 2000 and 1998. 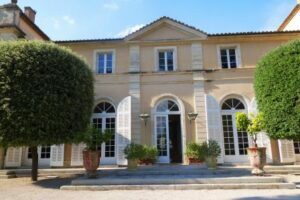 Chateau La Nerthe produces 3 red Chateauneuf du Pape wines and 2 Chateauneuf du Pape Blanc wines. Chateau La Nerthe Chateauneuf du Pape – 55% Grenache, 17% Syrah, 15% Mourvedre, 7% Cinsault, 3% Counoise and the remaining 3% is a blend of the other varietals planted in the vineyard. Over the years, the amount of Grenache in the blend has decreased. The terroir is rocks, stones and sand soils. The vines are planted in la Crau, les Escondudes, la Reves and course the la Nerthe lieux-dits. The wine is aged in a combination of vessels that vary, depending on the varietals for 12 to 18 months. On average today you find 18% new, French oak barrels, used oak barrels and tank to age the wines. Close to 15,000 cases are produced each year. Chateau La Nerthe Clos de la Graniere – 45% Grenache, 24% Syrah, 18% Mourvedre, 8% Cinsault with the remaining percentage split between various other grapes is the average blend. This can be thought of as the second wine of their flagship brand, as it comes from their youngest vines. The wine is aged for 6 months in concrete vats. A small percentage of the wine is aged in new, French oak barrels, with the remainder being aged in foudres. Close to 5,000 cases are produced each year. La Nerthe Cuvee des Cadettes has been in production since the end of the 1800’s. At the time it was produced 100% Grenache. The wine became a blend in the early 1900’s. An interesting fact for those that think special cuvees is a completely modern creation. However, the modern era for La Nerthe Cuvee Cadettes starts in 1970. Today, the blend is on average, 34% Grenache, 33% Syrah and 33% Mourvedre. The terroir is galets and sand. The vines are planted in the la Nerthe, la Crau, les Escondudes, and les Reves lieux-dits. Over the years, the amount of Grenache in the blend has been reduced. The wine is aged for an average of 12 months in 80% new, French oak barrels and 20% aged, French oak barrels. On average, close to 1,700 cases are produced each year. Chateau La Nerthe Chateauneuf du Pape Blanc is a blend of 32% Grenache blanc, 30% Roussanne, 22% Bourboulenc and 16% Clairette. Chateau La Nerthe Clos de Beauvenir is made from a blend of 60% Roussanne and 40% Clairette. Clos de Beauvenir is only produced in select vintages. The production is always quite small. The estate never makes over 250 cases of the special white wine. Chateau La Nerthe can be enjoyed on the young side. Young vintages can be popped and poured, or decanted for 1-2 hours. This allows the wine to soften and open its perfume. Older vintages might need very little decanting, just enough to remove the sediment. Chateau La Nerthe is usually better with 4-8 years of bottle age. Of course that can vary slightly, depending on the vintage. In the best vintages the wine should be consumed within 5-20 years after the vintage. Chateau La Nerthe is best served at 15.5 degrees Celsius, 60 degrees Fahrenheit. The cool, almost cellar temperature gives the wine more freshness and lift. Chateau La Nerthe is best served with all types of classic meat dishes, veal, pork, beef, lamb, duck, game, roast chicken, roasted, braised, stewed dishes, sausage, barbecue, grilled meats and cassoulet. Chateau La Nerthe is also good with Asian dishes, hearty fish courses like tuna, mushrooms, cheese, pasta, eggplant and tomatoes. The white wine of Chateau La Nerthe is best served with a myriad of different seafood dishes, shellfish, crab, lobster, sushi, sashimi, chicken, pork and veal, as well as Asian cuisine. Chateau La Nerthe also owns vines in the Cotes du Rhone appellation where they produce red and white wines at Domaine de la Renjarde, Domaine de la Renjarde Cotes du Rhone Villages les Terraces and Domaine de la Renjarde Massif d’Uchaux. Spicy, sweet, soft and fresh, the vibrant red fruits offer length, precision and length with complexity. It is going to take time in the cellar ti come around, so be prepared to wait. The wine was made from blending 52% Grenache, 38% Syrah and 10% Mourvedre. Smoke, incense, herbs and red fruits are in the nose. On the palate, the wine offers round, sweet, ripe, smoky, dark red berries, finishing with a real sense of plushness. The wine is concentrated and polished and was produced using mostly Grenache with Syrah, Mourvedre and several other assorted grape varietals which can vary widely, from vintage to vintage. Spicy red fruits, smoke, espresso, and singed cherry pipe tobacco open the nose. On the palate, the wine serves up a delicious, concentrated blast of juicy kirsch, with freshness, spice, smoke and espresso bean. The wine was made from blending 34% Grenache, 33% Syrah and 33% Mourvedre. Incense, smoke, black raspberry, thyme and garrigue come out to play. From there, the medium bodied wine offers a sweet and tart, wild cherry profile, soft textures and an espresso and smoke filled, red berry finish. The wine was made blending 50% Grenache, 25% Syrah, 20% Mourvedre, 25% and 5% Cinsault. A little oaky, but once past the wood, the sweet, raspberry and tart cherry notes kick in. Soft, smooth and already approachable, this round, polished, lush, modern styled wine will be nice to drink on release. Oak, licorice, smoke, earth and cherries line up together. The wine is round, rich and showcases a supple quality to the ripe fruit. The wine was produced with 42% Syrah, 37% Grenache and 21% Mourvedre. Touches of oak, with licorice and black raspberry in the nose, the wine is round, soft and approachable. 43% Grenache, 30% Syrah and 22% Mourvedre created the blend. Oaky, supple and rich, there is good sweetness, flesh and charm in the modern styled, lush, polished, smoky fruit. This should be better once the oak integrates. Produced from a blend of 39% Syrah, 37% Grenache and 22% Mourvedre. Vanilla and black cherry are found in this ripe, plush, modern, creamy style of Chateauneuf du Pape. From a unique blend of 44% Grenache, 27% Syrah. 14% Mourvedre and 5% Cinsault, the wine reached 14% alcohol. Coffee bean, fresh, ripe red berries and spice on the nose carry through to the silky, smooth, creamy, kirsch filled finish. Light on the nose, medium bodied on the palate, the forward styled, easy to drink wine requires consumption in its youth to get the most from its red berry character. With one of the higher percentages of Mourvedre as well as Syrah in Chateauneuf du Pape, this stylish wine explodes with licorice, dark berries with hints of blue fruits and coffee bean in the perfume. Powerful, rich and character filled, the wine is silky, sweet and lush. There is some noticeable oak, but that would come together with time. Nut, honeysuckle, caramel, orange and citrus scents pop. The wine is fat, juicy, rich and oily, leaving with freshness, white fruit and citrus in the finish. Good depth of color, most of the influence from the 15% new, French oak barrels has completely integrated into the wine leaving you with an open, plush, spicy, cherry and plum personality with freshness and ripe fruit in the finish. This delicious, ripe, rich wine is filled with roasted red berries, kirsch, spice and earthy sensations. Espresso, black and blue fruits, 5 spice, smoke and fennel notes are found in the nose. Polished in texture, modern in style, the wine is rich and silky, with a round, spicy, black cherry character. Rich, fat, ripe, sweet, juicy, lush black raspberries, kirsch, earth, jam, pepper and smoky aromas are the perfect pair for the round, opulent textures and ripe flavors. There is a hint of oak, but there is so much fruit, it's almost buried. This blend of 37% Syrah, 32% Grenache and 31% Mourvedre is all about pleasure. Medium bodied, luscious, sweet and ripe, this easy to like, black raspberry dominate wine is already showing well. Medium bodied, smoky, open, forward in style, this easy to drink wine, with its smoky, cherry and espresso bean core is ready for drinking. Like most 2007 Chateauneuf du Pape, this is already delicious. This forward, modern styled wine opens with ripe, dark berries, jam, smoke, vanilla, fresh herbs and pepper. Round, plush and filled with sweet ripe and over ripe, juicy berries, if you have a bottle, pop a cork. This delicious, round, supple vintage of La Nerte offers jammy black raspberries, garrigue, fennel, spice and earthy notes. On the palate, the wine is lush, rich and ends with a concentrated mouthful of ripe, black cherries. Ripe, rich, sweet, dense, full bodied and loaded with ripe, juicy red and dark berries, earth, kirsch and smoke, this lush, round wine is starting to show well. From a unique blend of 39% Grenache, 37% Mourvedre and 24% Syrah, this is really showing its stuff. Layers of smoky dark berries, black cherry liqueur, kirsch and earthy are all over the place. The wine is rich, plush and mouth filling. What a nice surprise to taste this wine from magnum. Pepper, strawberry, black cherry, spice, earth, garrigue and black traspberry scents paried well with the elegant, soft textures. The wine ended up with an array of soft, peppery, jammy, red berries, earth and plums. Out of magnum, this was much better than my previous tasting from a 750.